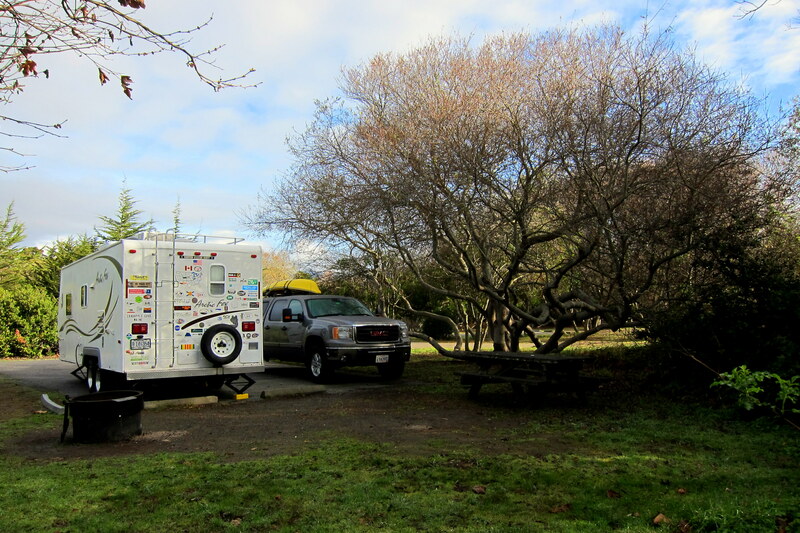 Tuesday, February 4, 2014: Today is the day we shake off the cobwebs of stationary RV’ing and hit the dusty trail. Even as we are saddened with the thought of leaving Jack and Tucker (and their parents) we are anxious to see what is around the next mountain as we meander westerly toward the coast of California. On the road at 0935 under typically clear and sunny skies with a pleasant temperature of 60 degrees. Kit, not being a morning person, has been a real sport about getting up and on the go for a “travel day” however, usually there are a few miscues……like this morning when she forgot to comb her pillow coiffed hair. Driving down Las Vegas Boulevard with The Strip in our rearview mirror, Kit and I make our way west to I-15. Soon after passing over the NV/CA border we encountered this strange looking apparatus shining in the morning sun. There were three of these towers each surrounded by thousands of reflective panels. The brilliant glow emanating from the top of the towers was blindingly bright and appeared to vaporize whatever moisture was nearby in this otherwise very dry environment. This Rube Goldberg looking structure is The Ivanpah Solar Electric Generating System. 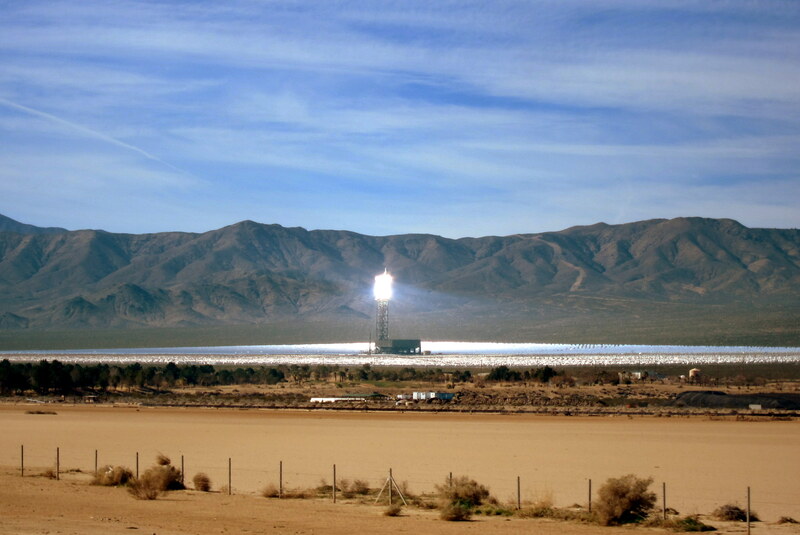 The 2.2 Billion dollar “solar thermal power plant” is built on 4,000 acres of federal land and bankrolled by Google as well as other investors with loan guarantees provided by the US Energy Department. The system when operating at capacity will reduce carbon dioxide emissions by more than 400,000 tons a year as compared to traditional coal fired power plants but at a cost per megawatt penalty of two and a half times. When it officially goes online next week it will have the capacity to provide continuous power to approximately 140,000 homes. During construction there were concerns about habitat destruction of the threatened desert tortoise. So, as many as 1,000 head of torti were rounded up and herded by a tiny cowpoke to a location 8 miles away…..a forced migration that delayed construction considerably. The remaining primary wildlife concern is how to protect the birds who while on peaceful migration through this traditional flyway periodically fall out of the sky with singed feathers. The solar-boiler concept is quite simple and elegant, but highly technical. Basically 350,000 computer controlled mirrors about the size of an average garage door track the sun as it arcs across the sky. These mirrors then reflect the sunlight to the top of three 460 foot towers where “thermal boilers” are waiting to turn water into high pressure steam. From that point the system operates like a traditional power generating plant by using the steam to rotate turbines attached to generators. As always, there is a trade off between clean renewal power and the destruction of a pristine environment…..regardless of what side of the debate one stands, this facility is some impressive! At 1125, we pulled into the Valley Wells Rest Area for lunch and some walking around time. 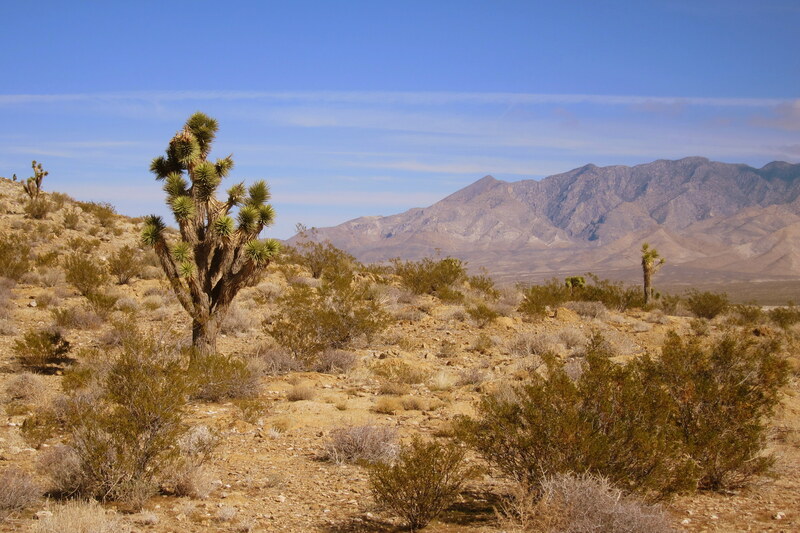 The high desert plateau is at a suitable altitude for Joshua Tree growth and the surrounding mountains beautifully frame this unique plant. 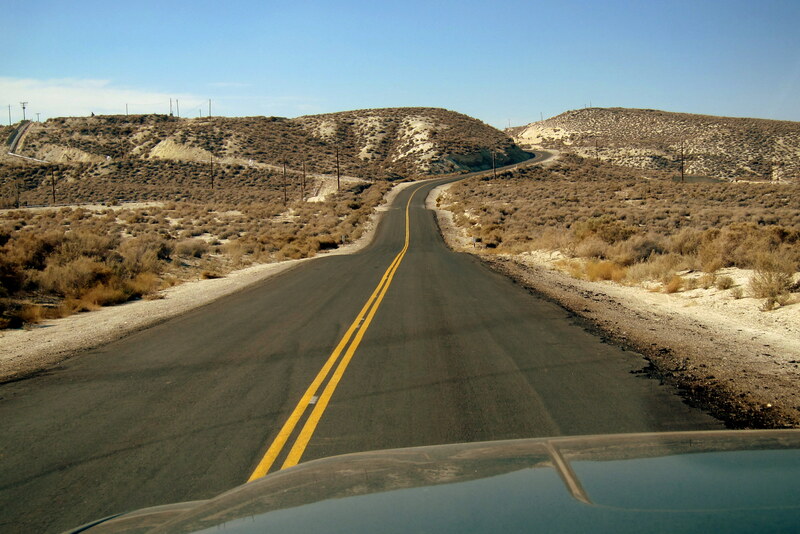 Back on the road, we continue west and quickly start to lose elevation as we descend into the Mojave Desert. Soon we pass Baker, home of the world’s largest thermometer, which was featured in an earlier journal. And for the first time in six years of traveling through California there was no one at the Agricultural Inspection Station so we doubled back to retrieve all the oranges we had chucked out the window when we noticed the station was looming on the horizon. Just kidding…..actually we have never had to dispose of any fruits or vegetables at any of the many checkpoints we have encountered…..not sure what they are trying to keep out of California? Climbing into the southern Sierra Nevada Mountains we peak out at 4064 feet as we navigate the Tehachapi Pass and descend into the San Joaquin Valley. Leaving I-15 we move onto CA-58 toward Barstow where we encounter CA-99 toward Bakersfield and our stop for the evening…..River Run RV Park. 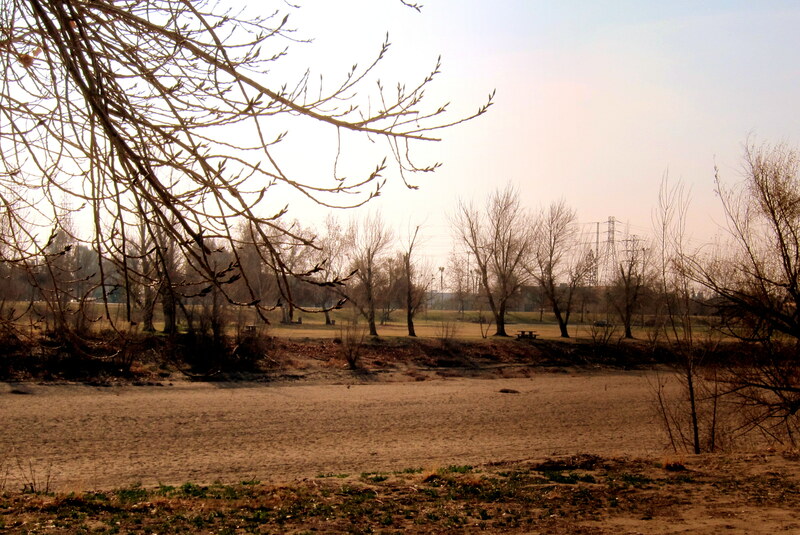 River Run is a commercial campground on the banks of the Kern River. Since we were only staying overnight, we left truck hooked to trailer and spent the late afternoon walking about this nice clean and well managed park. Even though it is currently 56 degrees, it feels far colder than 56 degrees in Las Vegas. Apparently the difference was in the humidity…..86 percent as opposed to the 21 percent we enjoyed in Nevada and that made it feel a lot cooler. Walking to the river bank to ascertain the feasibility of a kayaking opportunity I was confronted by this distressing sight. According to the Campground Host, California has been experiencing a severe drought and the population is subjected to pretty austere water rationing edicts. The Kern River, normally flowing freely this time of the year, has been diverted for higher priority uses such as crop irrigation and fire protection. Everything is tinder dry and the ever present threat of wildfires has been enhanced by the absence of mountain snow and valley rainfall. After an enjoyable meal (yes, we actually ate in the camper) we did some reading and turned in for the night. Wednesday, February 5, 2014: Up to cool and clear skies. Had breakfast, broke camp and on the road by 1000. Kit had accomplished some research the night before and discovered there was an Arctic Fox RV dealer in town, and what do you know, it was located right along our intended route! So at about 1030 we pulled into the RV Peddler lot and created a bit of interest as folks realized we were pulling an old, very well-traveled and very well maintained Arctic Fox Travel Trailer…..it was kinda like a homecoming of sorts. After an hour or so of pursuing the new models, which by the way have changed significantly over the years, our very patient and friendly salesman introduced us to the owner and then the sales manager. Even though they knew we had no intention of purchasing a new RV all the staff treated us with kindness and professionalism. If you’re in California and looking for an RV or need RV service, check these folks out. Blake, the Sales Manager was quite a character. In addition to his day job he is a published author and was kind enough to autograph and gift us his latest creation, a biography of the Alaskan crab boat captain, Phil Harris. 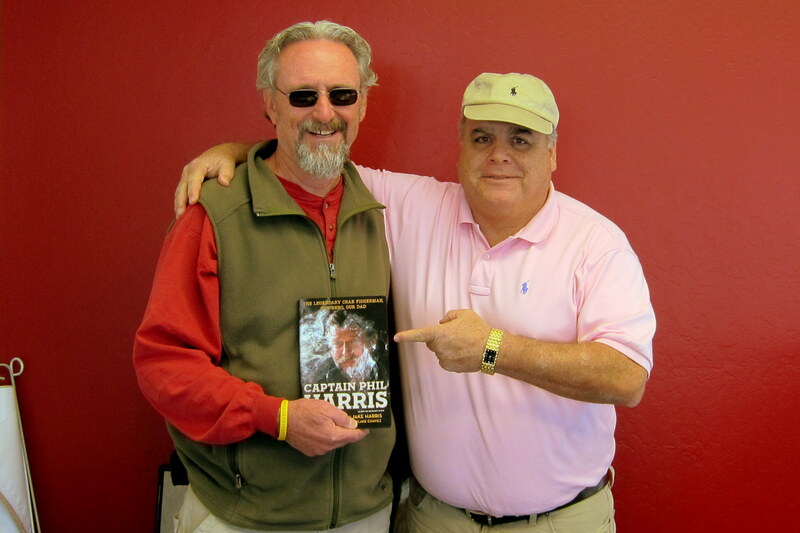 Before his untimely passing, Captain Harris was featured on the reality TV show The Dangerous Catch. Blake with Phil’s two sons co-authored this tribute to Phil and the Crab Fishing family. 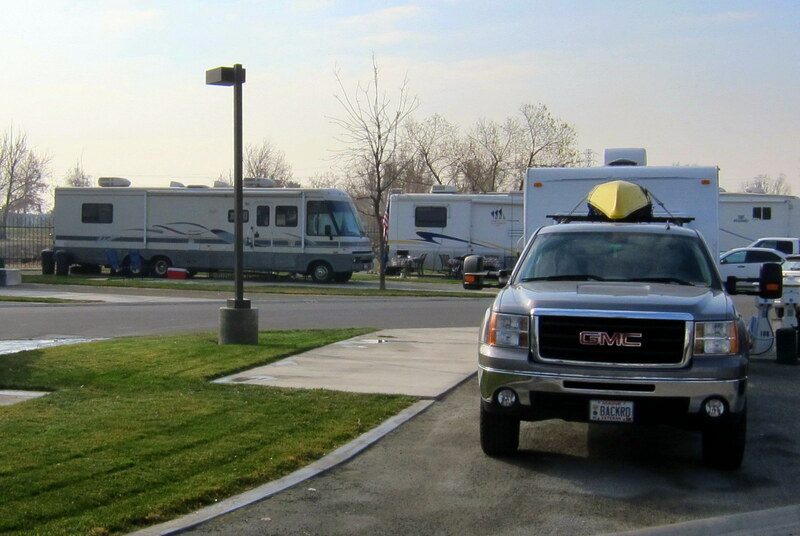 Leaving the RV dealership we found our way back to CA-58 and headed west toward the town of Buttonwillow. Rolling through this tiny town, we decided to stop for fuel and to find out what was up with the unusual name. Turns out the town is named after a common desert plant that grows in abundance in the area. Continuing on CA-58 we wound our way into the western foothills of the San Joaquin Valley and started to gain in elevation once again. After a number of steep hairpin turns we tipped over the summit at 3,285 feet and entered a high desert plateau that contained scattered ranches and feed lots. Needing a break and getting hungry we pulled off at a wide spot in the road. After about an hour and adequately refreshed, we continued west on CA-58 and soon started to lose altitude as we sighted the Pacific Ocean in the distance. 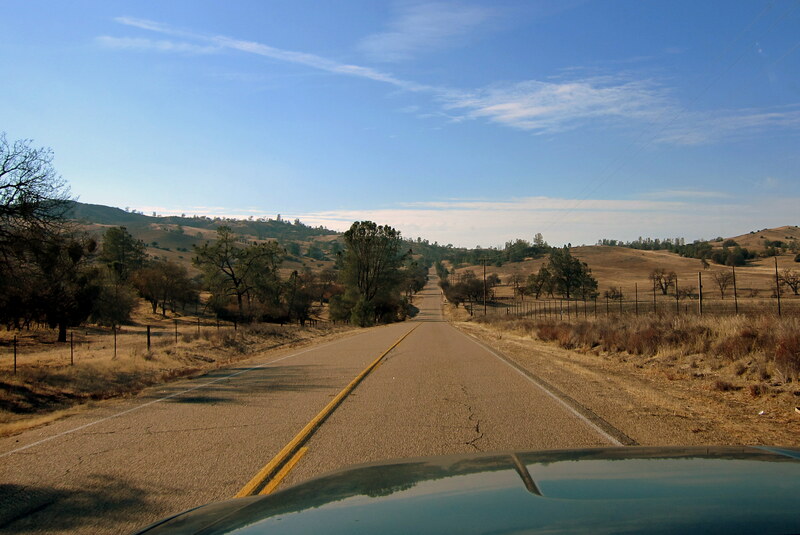 Around 1530, we moved over to US-101 (also known as El Camino Real) and headed north where we connected to CA-1 (also known as The Pacific Coast Highway). 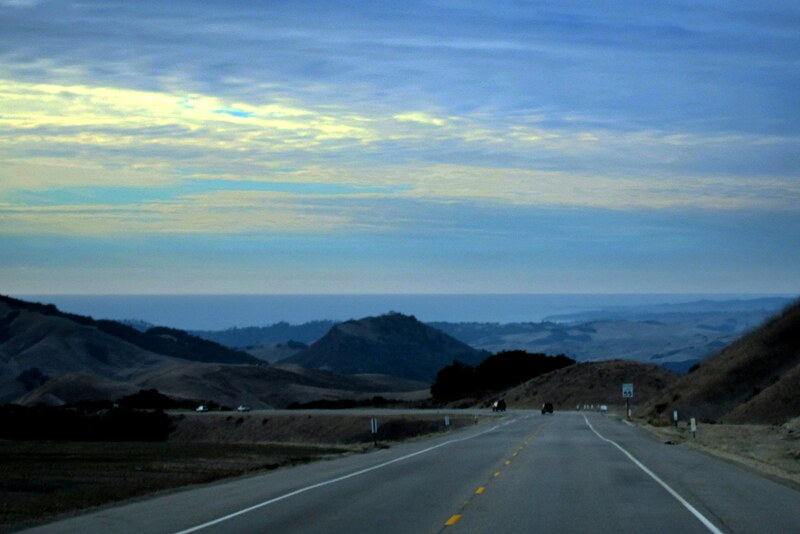 Within an hour, we were pulling into San Simeon State Park, which was to be our home-base for the next couple of days. Being mid-week, the rustic park was sparsely populated and the sites were spacious but not very deep and there were no hookups. We found a suitable campsite, disconnected and leveled the camper. 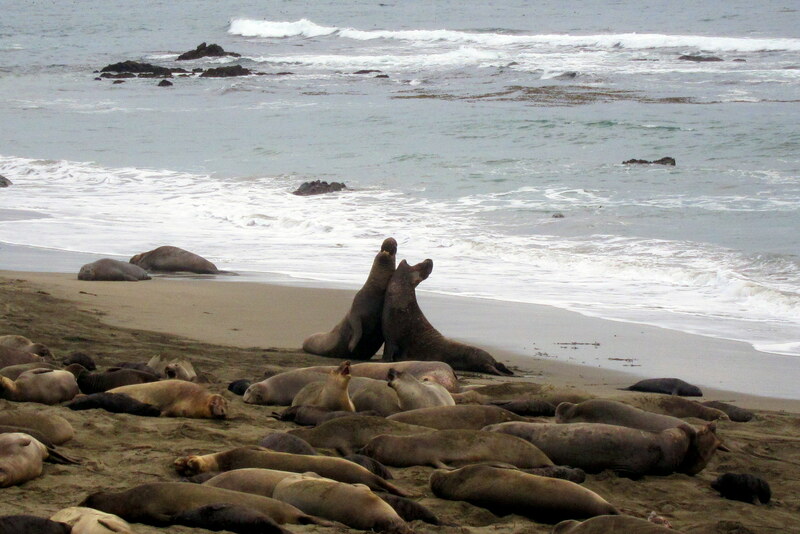 San Simeon State Park is located in mid-coastal California and about 35 miles north of San Luis Obispo, nestled between the Santa Lucia Mountains and the Pacific Ocean. 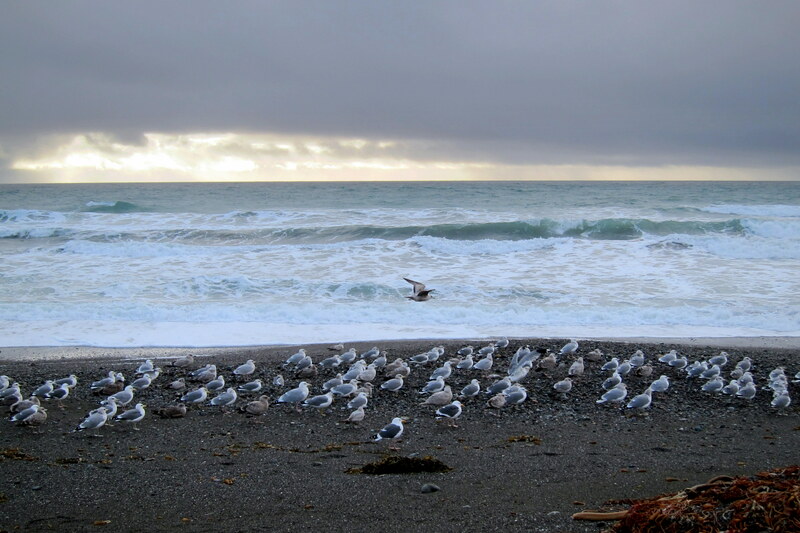 A trail from the campground leads to a large beach where gulls keep watch as the Pacific surf encounters the rugged coast. Using a photo technique my friend David, a certified wildlife photography superstar, taught me many years ago, I began snapping pictures as I steadily moved toward the flock of stationary and distracted land bound gulls. Stealthily I advanced to within about 10 feet of the birds all the while snapping away with my puny camera. 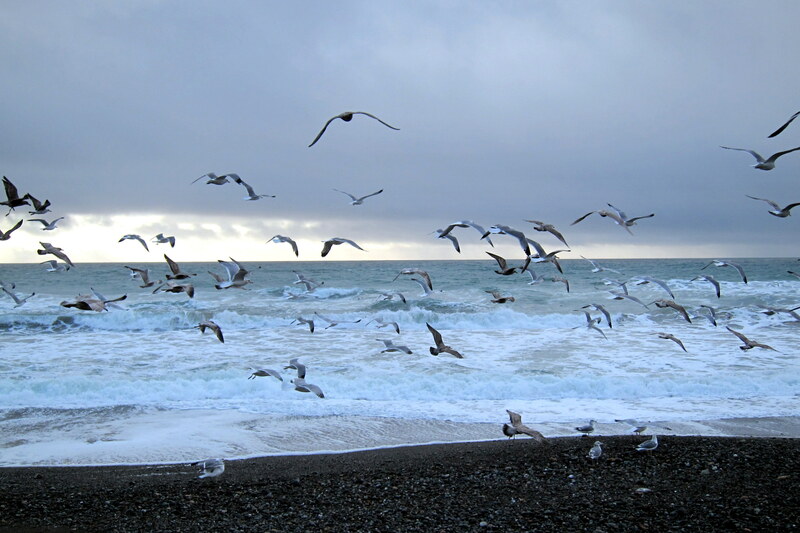 Something must have of spooked the gulls as they simultaneously took flight with a great rush of wings flapping and vocal squawking. The explosion of birds startled me but I still managed to squeeze off a few more shots before making a hasty retreat. Not sure who had the upper hand here, but truly believe the gulls were laughing just as hard as I was! Retreating from the surf line I stopped to appreciate some of the many smooth and brightly colored beach-stones that were littered about. Safely back at the trailer and with the crashing surf as a backdrop we slowly drifted off to sleep in anticipation of more adventures to come. 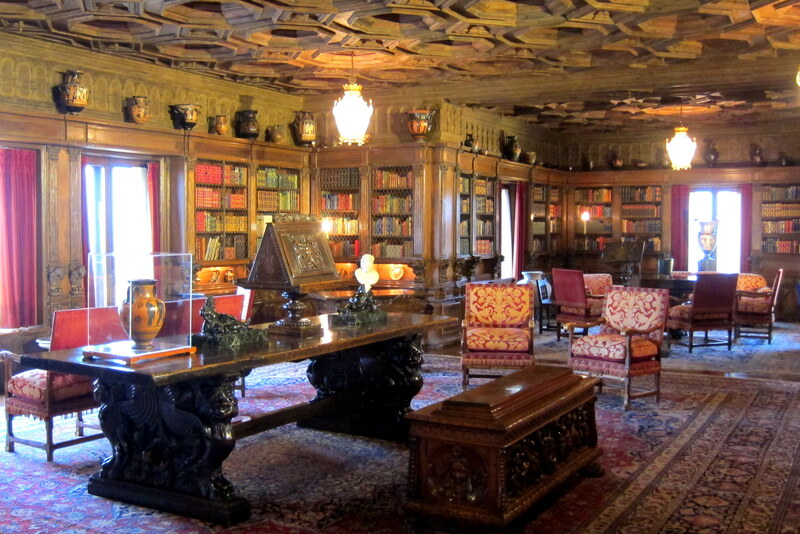 Thursday, February 6, 2014 and Friday, February 7, 2014-Hearst Castle, San Simeon, CA: The prime reason for coming here is to finally satisfy one of Kit’s long anticipated Bucket List items…..tour Hearst Castle. 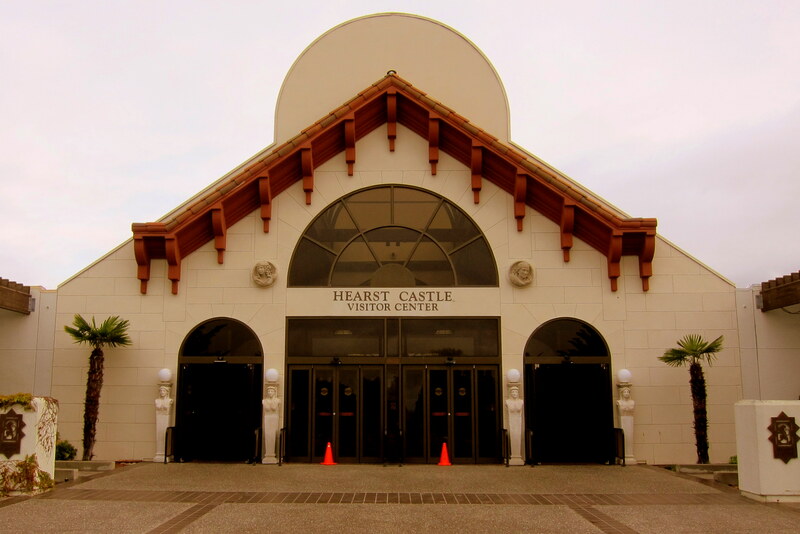 The visitor’s center is next to the highway, and is the embarkation point for the five mile bus ride to the grounds of Hearst castle situated high on a promontory overlooking the ocean. The above aerial shot was grabbed from the internet as the coastal fog didn’t allow for very clear outdoor photography. And besides this place is so large it is impossible to capture it all in a single frame from the ground. The three “Guest cottages” at left average about 2500 square feet and the main house “The Castle” is three floors, contains 56 bedrooms and is over 60,000 square feet in living area. Kit and I had driven by this place a few times back in 1975 while taking a shakedown cruise in our newly acquired 1967 Excel Travel Trailer…..yep, we started our enjoyment of RV travel that long ago! The trailer was 15 feet long with no bathroom and we had all three kids in tow. Someday I intend to chronicle all our earlier RV trips and digitize the photos to make a retrospective Journal entry to this website. 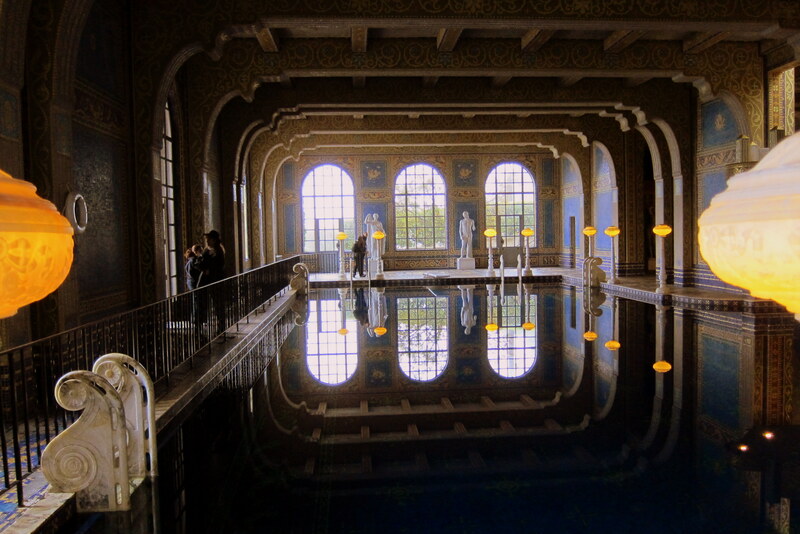 We literally spent the better part of two full days at Hearst Castle, and could have spent even more time……the place is that large! 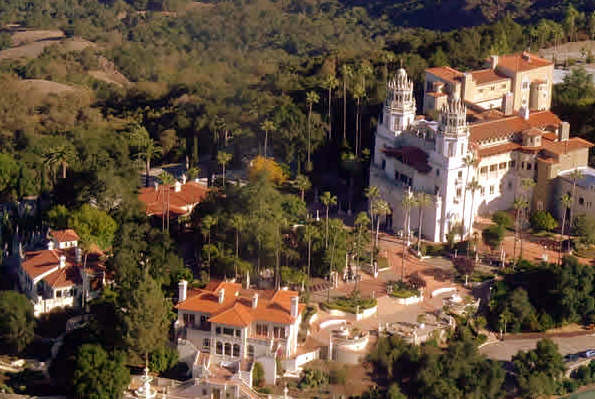 At the visitor’s center, there is a 20 minute film on the story of Hearst Castle as well as the life of William Randolph Hearst. Then one can select from a number of comprehensive guided tours. We selected three, The Grand Rooms Tour….. 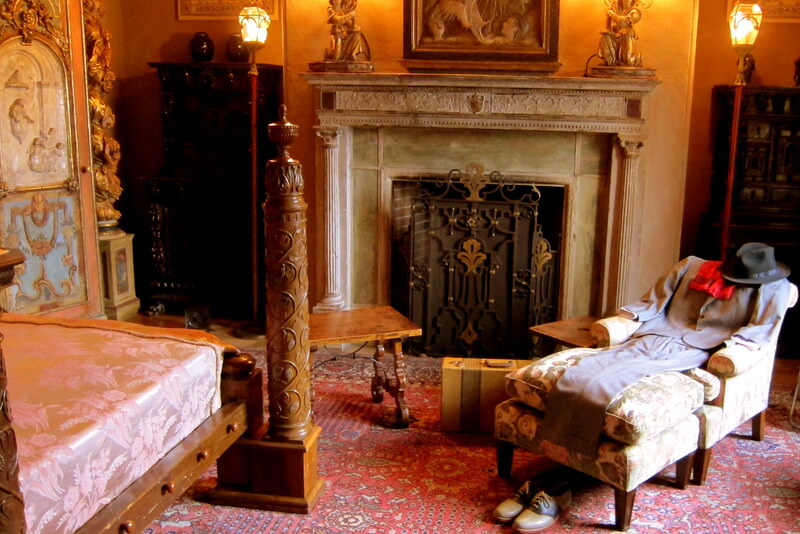 Which featured the families private living quarters, including Mr. Hearst’s office where he managed his 95 separate enterprises. And, The Cottages Tour, featuring accommodations that were frequently inhabited by various Hollywood celebrities of the day as well as prominent politicians. The bedrooms of the cottages, each with its own separate bathroom, came complete with a suitable wardrobe in the guest’s size to ensure they would be properly dressed for the occasions that were planned. But there were no kitchens…..Mr. Hearst wanted his guests to mingle and eat as a family, so the only dining facilities were in the main house. Many of the décor items and furniture pieces were antiques acquired by Mr. Hearst during his frequent trips to Europe and Asia. The place is full of these priceless artifacts and rivals the collections of the world’s best museums. Even the ceiling panels were salvaged from old castles and churches and fitted into the various rooms. The construction of this magnificent estate was begun in 1919 when Mr. Hearst possessed a staggering net-worth of 30 Billion Dollars primarily from his publishing enterprises. Over the next 32 years the scope, style and size of the property morphed into what one sees today. There is a theory that Mr. Hearst far more enjoyed the process of designing and building the place than actually residing in it. At his death in 1951, construction was still being accomplished. However, on the dark side, there was the Patty Hearst incident from the 1970’s and a bit further back; Mr. William Randolph Hearst himself was a bit nefarious. He lived a double life enjoying what was called a “formal marriage” with his wife Millicent, a socialite who resided in New York City with the couples children. 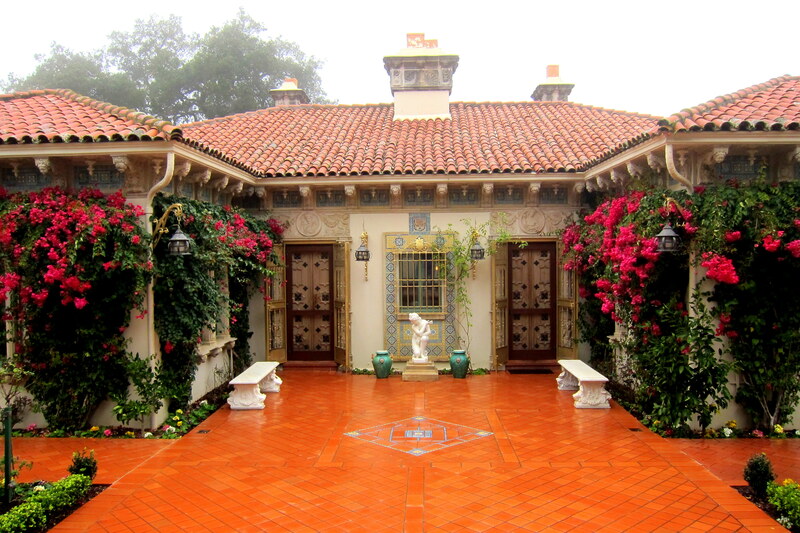 He also kept a mistress at Hearst castle…..a Ms. Marion Davies of Hollywood, who was a young starlet. After the series of tours, visitors were allowed to roam the estate and visit the two swimming pools the largest of which was The Neptune Pool. This was the final iteration of previous pools on this site. Nearing completion, the first two did not meet with Mr. Hearst’s approval and were completely torn out. One concrete contractor quit in disgust stating “I have torn out more concrete than I have poured”! The second pool, although smaller in size, is far more dramatic. 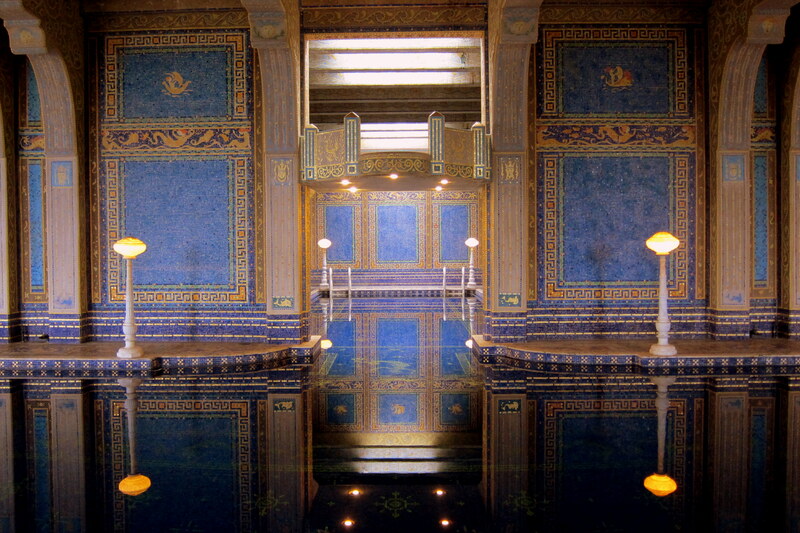 It is modeled after Roman Bath’s that Mr. Hearst had seen when traveling in Italy years earlier. Even in the subdued light of this overcast and foggy day the light streaming through the windows created a dramatic mood to this indoor pool. It also contains a diving platform that is reported to be the most filmed poolside structure in history, being depicted in many feature length films of the day. 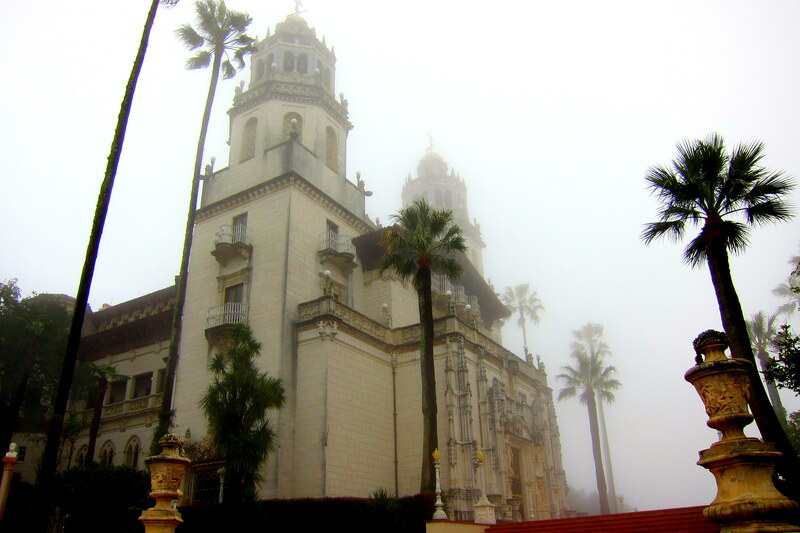 Even though the visit to Hearst Castle was Kit’s must see item in this area of California, I thoroughly enjoyed the visit as well. At no time since or likely at no time in the future will such a masterpiece ever be built again. Since the castle is sort of isolated, we enjoyed lunch on the premises. There are a few dining options all of which feature produce and meat grown at Hearst Ranch, which has been in continuous operation for almost 100 years. Just because my mind works in a weird way, I tend to see things in a weird way…..kinda weird, huh? Anyway at the very nice Hearst Castle visitors center there is a museum, an IMAX style theater, a nice café, and a large gift shop. In addition, as you would imagine, there are restroom facilities. Now it seems to me that the door and window are a bit too close and the wording of the sign over the window is rather disturbing. Perhaps this was a former training venue for a new Olympic sport being introduced in Sochi this month? All, in all, we had a great couple of days touring the famed Hearst Castle and learning about the fabled Hearst family. On the afternoon of our second day in the area, and after leaving The Hearst Castle, we were able to squeeze one of my Bucket List items in……watching seals during their annual migration to this part of the California Coast. 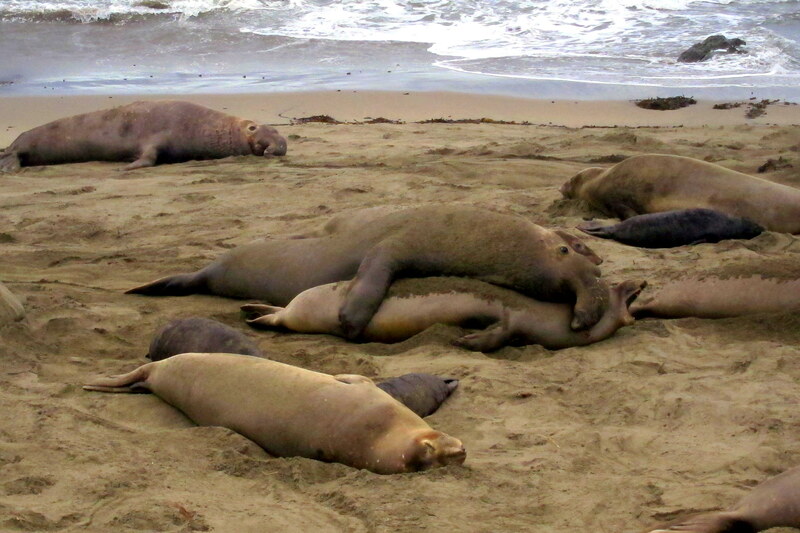 Just to the north of San Simeon, the beach at Piedras Blancas is one of many Elephant Seal Rookeries and this is prime birthing and mating season. 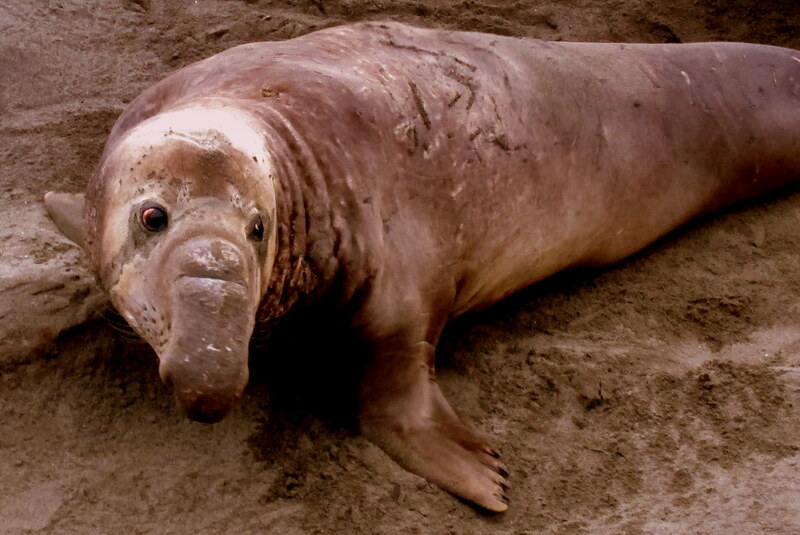 Elephant Seals spend a large portion of their time at sea, hundreds of miles from land, foraging on plankton and other available baitfish. 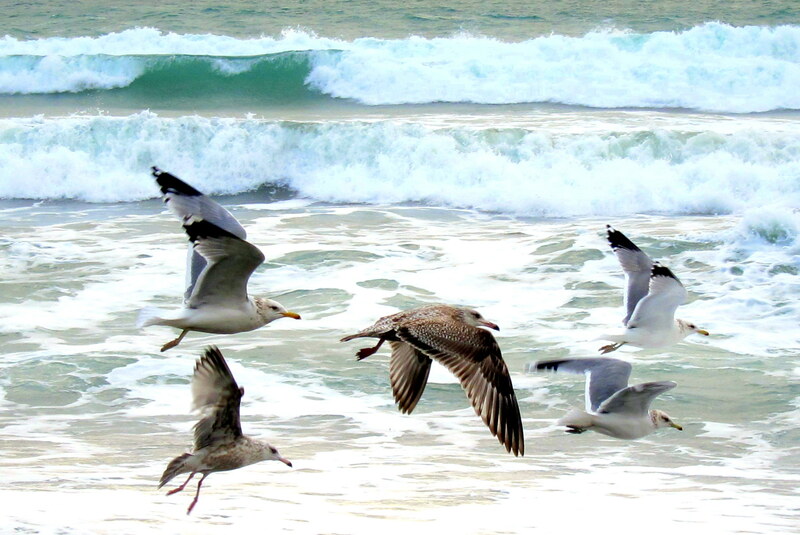 Every winter they return to this beach to birth, wean their young, and mate during a relatively short window of time. Possessing a very prominent proboscis, the up to 5,000 pound males pictured at left, fight other males for “Alpha Status” to mate a group of females. 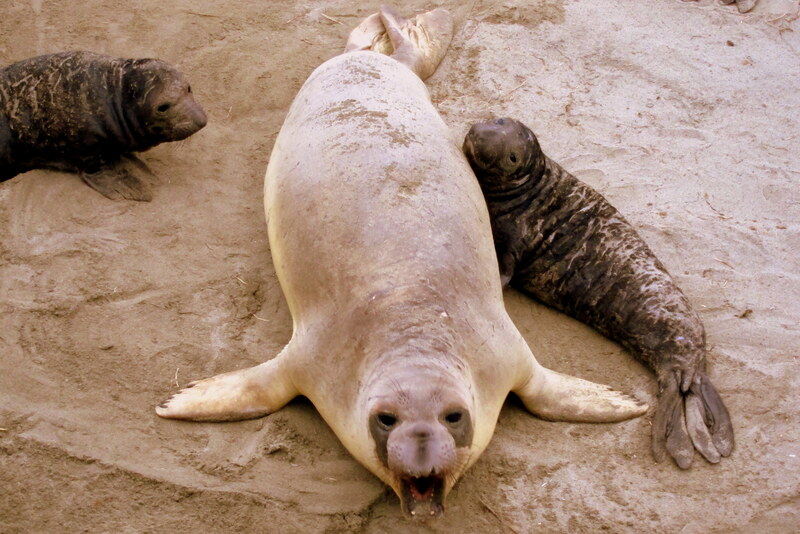 The smaller female, shown on the right, will lose half her body weight after birthing and nursing her young. And the tiny black pups will quadruple in size and weight in these short weeks. The pups are abruptly weaned when the newly impregnated mother sees fit to slip into the ocean and start her 9 month feeding period far to sea. Some of the male jousting can get pretty intense with physical and verbal assaults until one gives up and retreats to the shelter of the ocean, presumably to gain size and strength to try again next year. The victor gets to mate with many females and spends the rest of his time on the beach guarding his harem from intrusion by other males. Trying to capture a close up of the action I got a little too close to this nursing mother and she quickly let me know of her displeasure. And here is a close-up of one of the many males that were prancing about in front of the ladies. What an ugly dude…..surprised he can get any action at all! Kit and I spent a few hours on the bluff above the beach watching these fascinating animals…..what a thrill! On the way back to the campground we decided to stop by the small village of San Simeon and enjoy a seafood dinner. 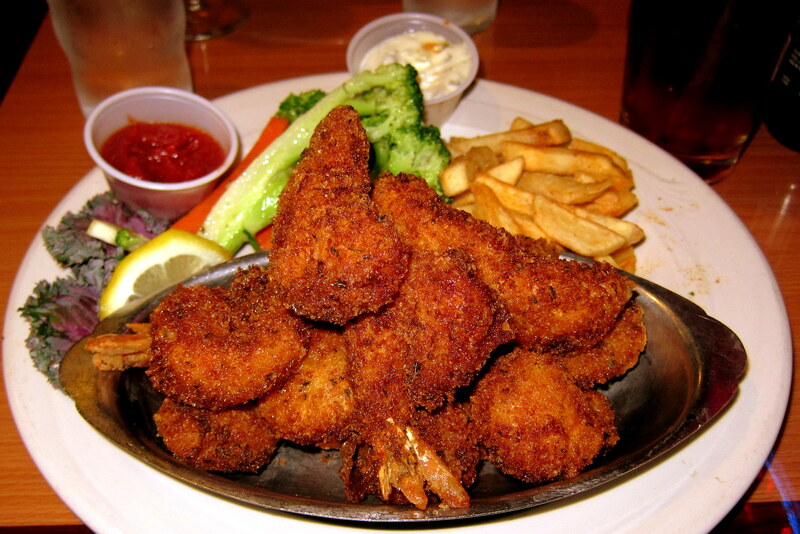 We had heard earlier that the San Simeon Beach Grill was the place to enjoy local seafood, so that is where we headed. The restaurant is a bit misnamed as the actual beach is across CA-1 and over about 200 yards of sand dunes and can’t even be seen or heard from the restaurant, but the food was pretty good. Kit ordered grilled salmon and I choose the Fisherman’s Platter consisting of Shrimp, Cod and scallops lightly fried in a seasoned corn meal based coating. Both were excellent dishes and were the perfect close to a very nice day! Saturday, February 8, 2014: Today we once again hit the road. 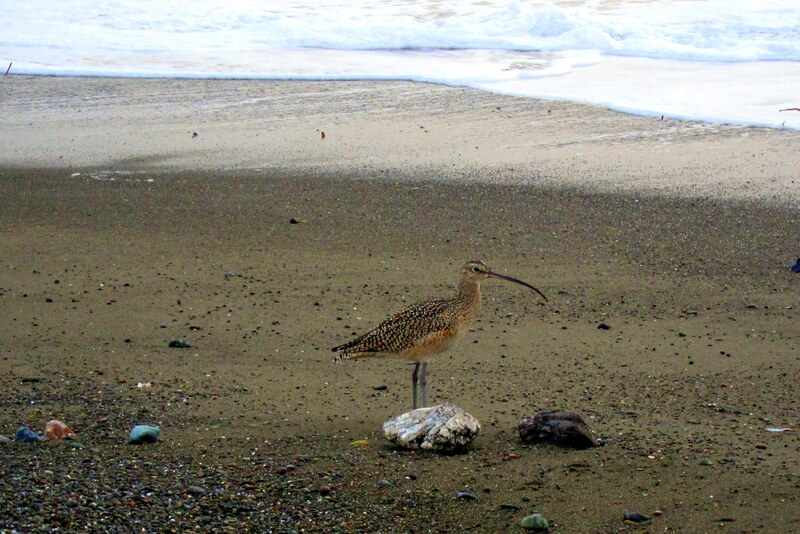 After a leisurely breakfast I took a final walk on the beach where this little fellow was searching out his breakfast. How do I know it’s the male of the species? Well, duh…..isn’t it pretty obvious? During our stay, the weather was cool, misty and rather gloomy…..which is typical for Coastal California during this time of the year. Back at camp, I hooked up truck to trailer and we got underway at 1040. Back on CA-1, we decided to head south in search of warmer and dryer weather. Since we were not in any hurry and Kit wanted to explore the shopping opportunities in a little village we spotted a few days ago, we pulled into Cambria, California. 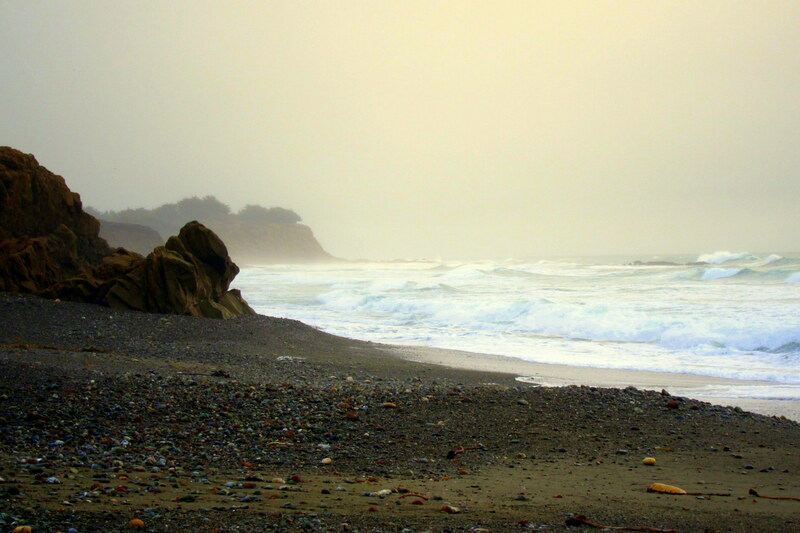 Cambria is a nice little coastal town but not one that has become overly touristy. Since it was Saturday, there were a lot of folks about which made for a great people watching opportunity for me and the hilly terrain gave me a great walking workout. And Kit enjoyed browsing in the many shops featuring Coastal California arts and crafts. Around noon Kit and I connected via text and decided to eat lunch at The Main Street Grill, a place I had under surveillance for part of the morning. 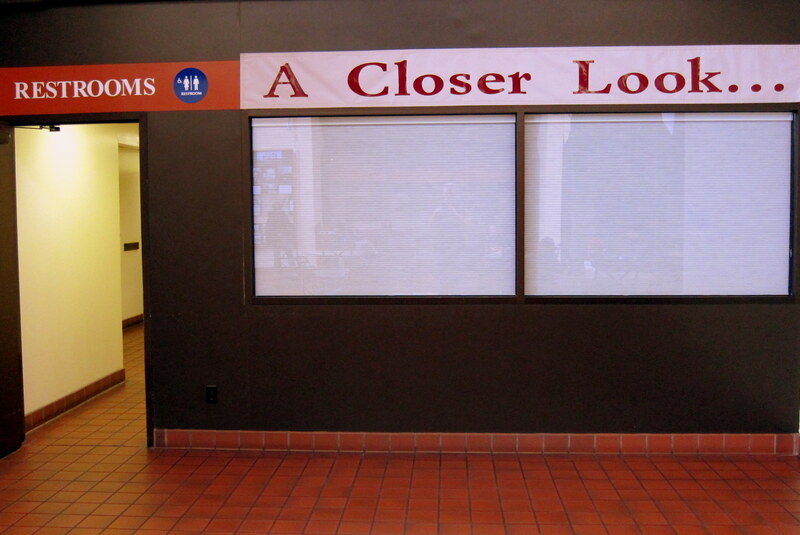 As soon as we walked through the door, we knew this was the place for us. The casual atmosphere and incredible smells made us feel instantly at home. 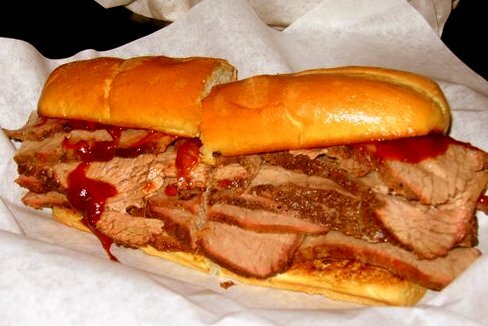 It looked as if the specialty was Tri-Tip Barbeque Sandwiches, so we both ordered one. They were incredible! Tender, juicy, perfectly cooked, spectacularly flavorful and meaty enough you needed a fork to eat one. 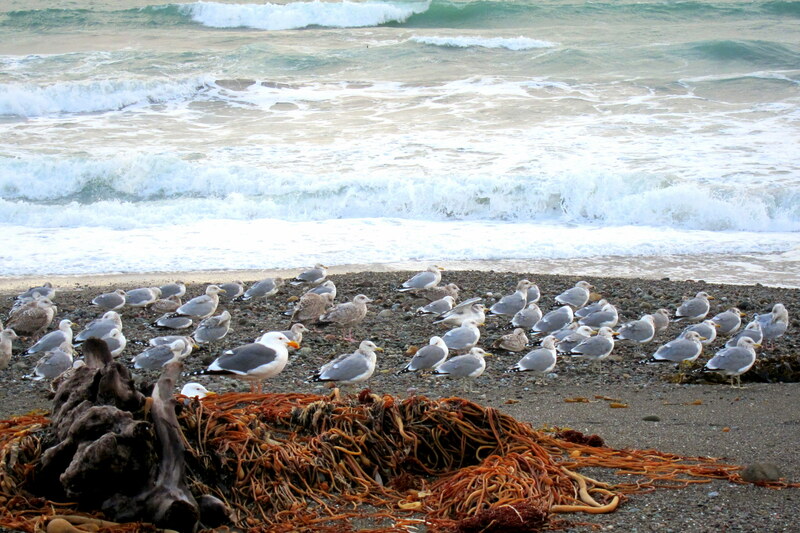 If you’re ever near the Central California coast, stop in Cambria at this place…..you will not regret it! At 1430, we once again climbed into the truck and continued our journey south. Traveling as we do with no particular agenda or itinerary, I generally motor along a few miles below the speed limit to enjoy the ride and conserve on fuel. However while driving on a narrow two lane road such as CA-1, I am constantly aware of any line of traffic I create and make every effort to slow down when I encounter a stretch of road where it is safe for others to pass, or I pull off the highway completely when an opportunity presents itself. Fortunately this is a frequent occurrence on this road as there are many scenic view pullouts available. However every once in a while an inpatient driver will gamble and pass when it is not safe or prudent to do so. Well today was one of those occurrences, and I truly believe I prevented a horrible accident and perhaps saved a few lives by my vigilance and actions. This clown, driving a minivan and in line a few cars behind us kept moving over and looking for a chance to pass us all but clearly there was a double yellow line, reduced visibility and oncoming traffic so I was shocked when we pulled out and accelerated. The two cars behind us slowed a bit to give him room to squeeze between us but he kept on coming trying to pass our 43 foot (truck and trailer combined length) rig as well. I immediately applied the brakes and pulled over as far to the right as possible and the string of oncoming traffic wisely did the same on their side. There was just enough room for the idiot to slip through. Unbelievable…..the Darwin Factor will take care of him soon I fear! Kit has wanted to return to San Luis Obispo (SLO) ever since visiting there to attend her nephews’ graduation from Cal Poly. So, nearing SLO we decided to seek out a place to camp and prefer that it be on the ocean. 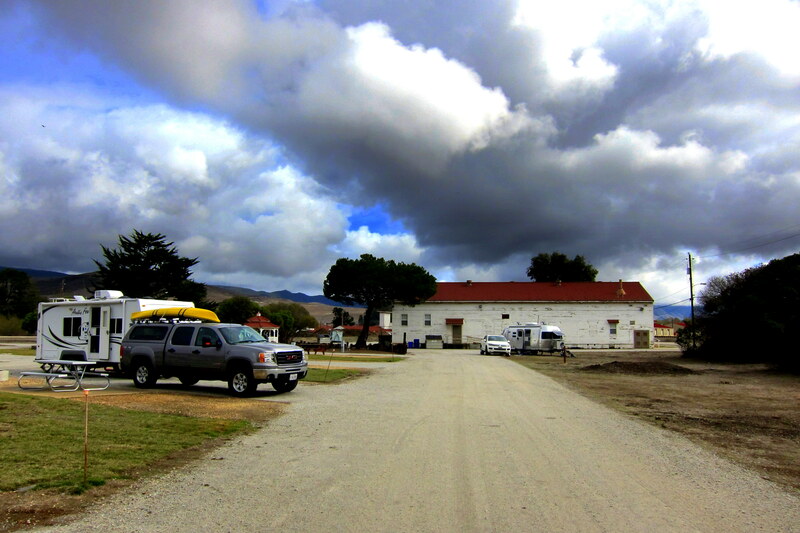 Pulling into a promising campground on Morro Bay, which was right across the water from the famed Morro Rock, we discovered a virtual parking lot turned into a RV Park with rates from $43.00 to $58.00 a night…..nope, not staying here. Sitting in the truck alongside the road we ascertained that any camping on the ocean was going to be crowded and expensive so we went to Plan “B” and looked for a military facility. A mere seven miles inland, between Morro Bay and San Luis Obispo there was a California Army National Guard Post with a small 12 site campground. So without much hope of bagging a site on short notice we called anyway. Surprise, there were two spots still available for the time we wanted to camp so we made a hasty trip to Camp San Luis Obispo (CSLO) and settled into a nice little campsite nestled in the San Luis Mountains. We relaxed for the rest of the afternoon and made a list of things to see and do in the area….stay tuned for Bill and Kit’s adventures in SLO Town. Kit’s Bits: I was a Happy Camper to be back on the Central Coast of California! Having attended my nephew Chris’s graduation ceremony from Cal Poly several years ago, I was eager to return to the area to explore and see Hearst Castle. The tour of the castle was great! Being able to spend an extra day there to go through the museum and watch the movie (twice) was also a nice treat. I was a bit alarmed to learn that William Hearst’s mistress last name was Davies (my maiden name), though. Happily, she wrote that she took the name Davies after her two sisters liked it so much, they had seen it on a sign somewhere, so she was not a “true” Davies. Plus, after reading the book, I learned that she was quite a “bimbo”, not too bright, to say the least. I loved visiting the little town of Cambria. I rarely buy anything (we are supposed to be getting rid of stuff at our age), but it’s fun to look at the beautiful arts and crafts created by the local folks. Plus, it’s always nice to chat with a few of the store owners and find out where they are from and how they transitioned to their current life style of being an artist/shop keeper. They are always eager to share their stories. Are you all going to make it to San Diego this year? Believe it or not we are in Maine and heading home tomorrow. We sure would love to see you. Hi folks. We heard you were in Maine, through the LM Grapevine. 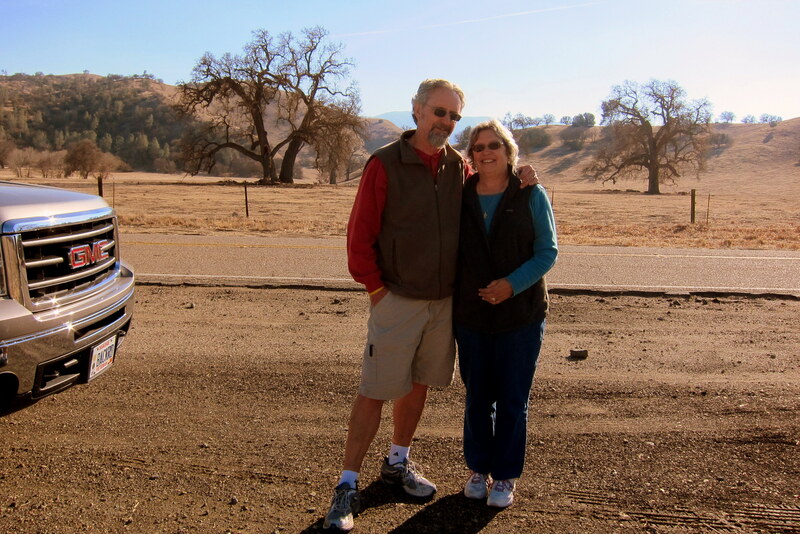 Yes indeed, we are slowly heading to San Diego…..currently at Point Mugu, your old stomping grounds as I recall. Hope to be in the area early March and stay at Fiddelers Cove on Coronado. Would love to visit with you folks as well, we will keep in touch as we make our way south. 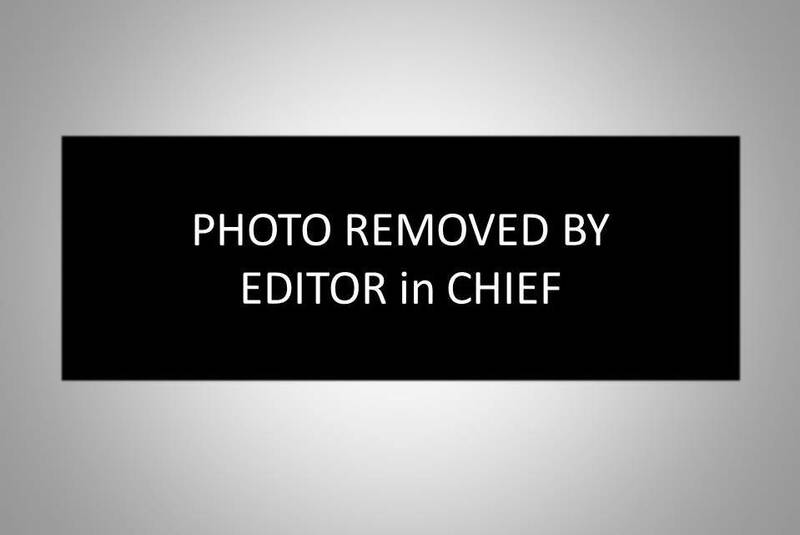 Glad to know the Editor-in-Chief has veto power on the photos used…LOL. 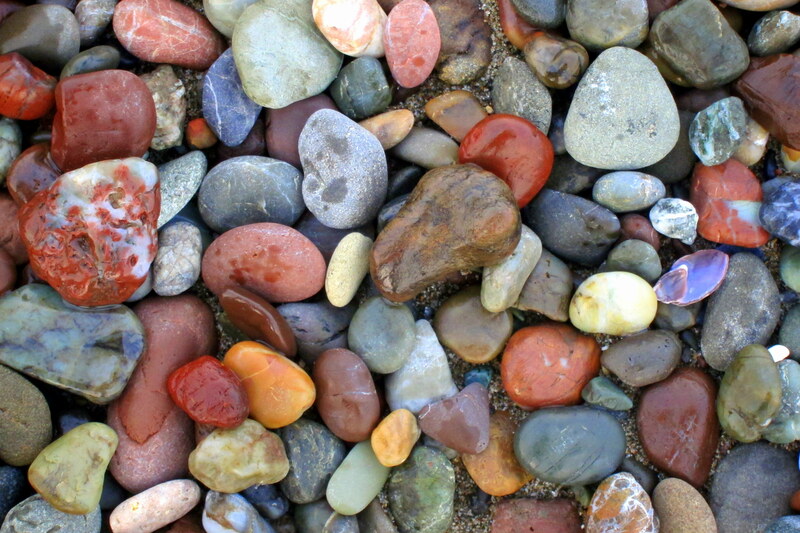 Love those colorful beach stones! Are they for real?? 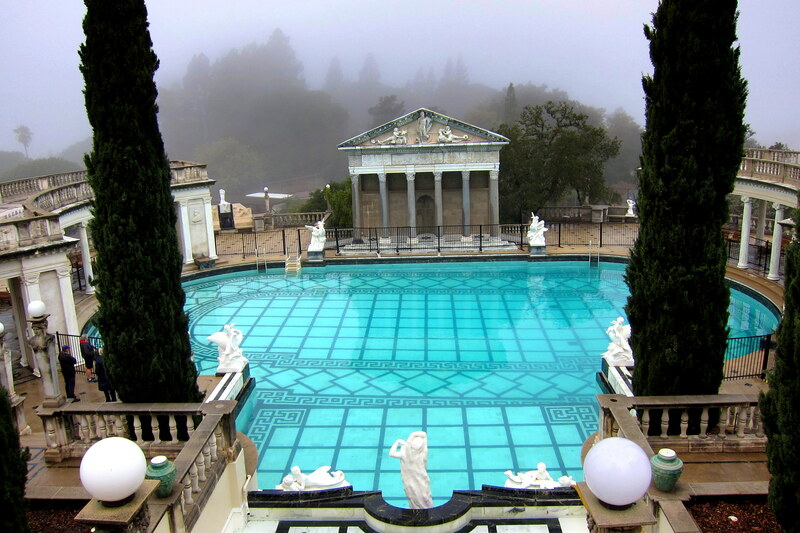 I’d like to someday tour the Hearst Castle. Looks like it is more impressive than the Biltmore and I loved that. Glad you could help save that idiot and all of the others that he placed in danger. Only wish he could have been taken off the road. Where are the cops when you need them? How do the idiots always manage to avoid them? Travel safe and we’ll see you soon. The Editor-in-Cheif has veto power on pert near everything I do…..which is a good thing lest the Darwin Factor causes me great harm. Those beach stones were indeed real, however being wet they were likely more vivid then usual. You folks stay safe as well, looking forward to hanging out with you this summer! 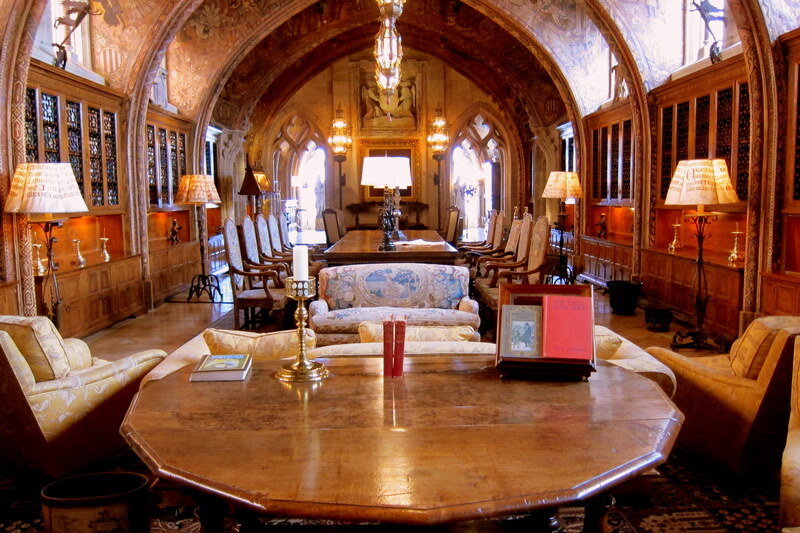 I I recently read an article about the Hearst estate, so I enjoyed your photos. 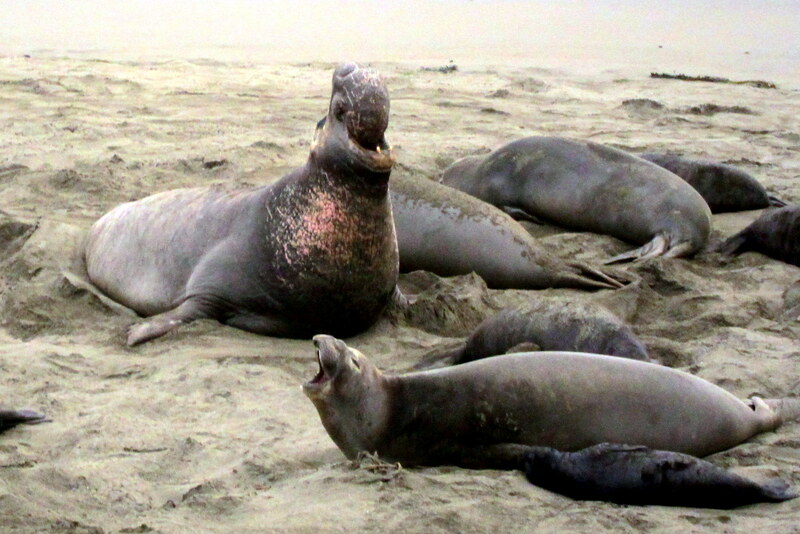 i also loved the ones of the seals and the CA coast. Nice to do virtual visiting during our cold and snowy winter. Thanks, touring the Hearst Castle was definitely a highlight of our stay in this part of California…..maybe you folks could take a detour down here on one of your future pilgrimages to Hawaii? Enjoyed your photos and stories…..travel safe you two. Thanks! See you at the lake this summer!! Do the birds really fall out of the sky with singed wings? Or is my gullibility showing?? 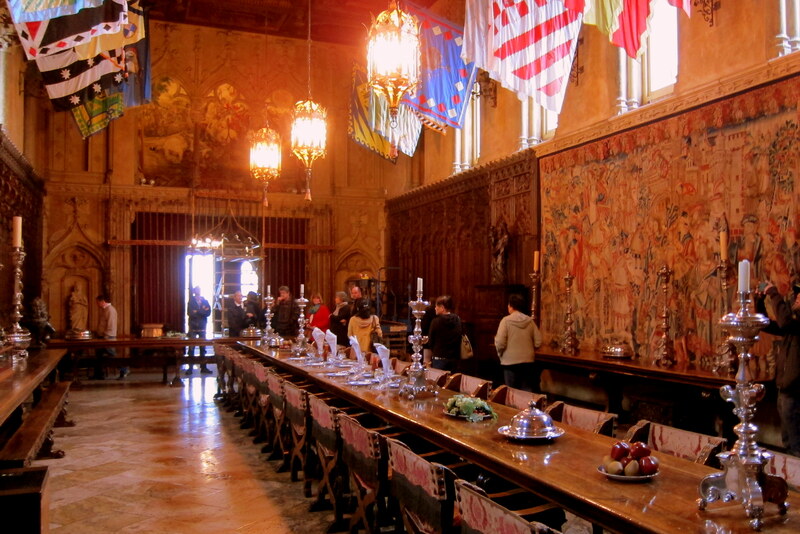 I’d love to see the Hearst Castle. I remember us driving by it as a kid! Actually…..they do, and there is a big environmental controversy going on as you can imagine. A lot of different things are being tried to minimize this occurrence and some are beginning to help. 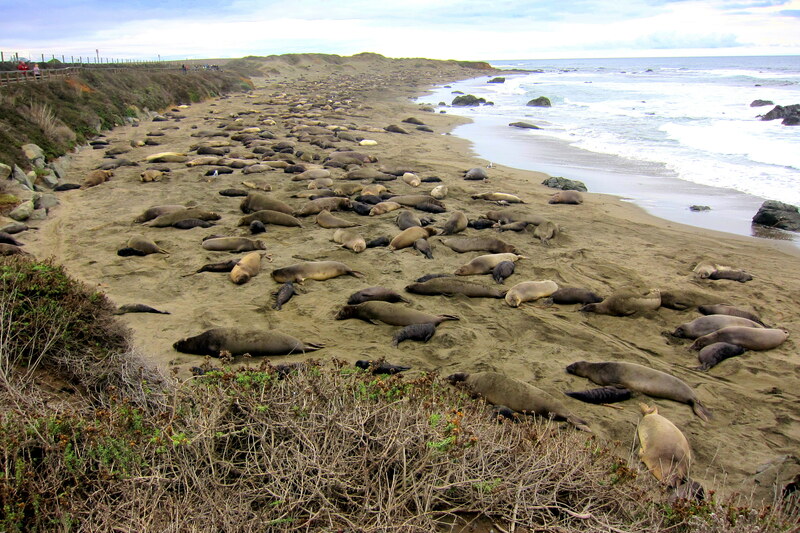 We just happened to have stayed over night in Cambria on our trip south from San Francisco a few years ago! It is a neat town & we too enjoyed a meal & shopping……visited the Hearst Castle & sea elephants……enjoyed your pictures as it brought back memories….thanks…..we had continued to do Big Sur & Carmel By The Sea……….Wow how beautiful!!!! Keep on trucking……..
Hi, great to hear from you and thanks for the nice comments. Yep, the central coast of California is our favorite region…..which is saying a lot as we both have fond memories of growing up in San Diego! Take care, looking forward to seeing you all this summer! We do…..thanks for noticing! Hope to stop by Sun City before we have to meander easterly, so watch out!